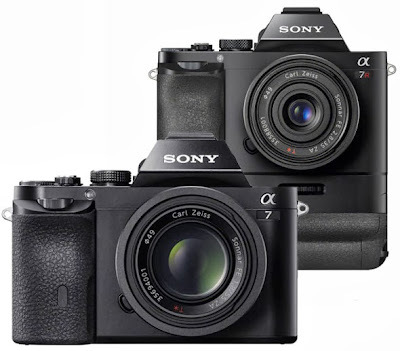 Sony has announced the A7 and A7R, the "world's first full-framed mirrorless" interchangeable lens cameras. Both cameras are housed in the dust- and moisture-resistant magnesium alloy casing and share the same manual controls, 2.4-million-dot XGA OLED electronic viewfinder with 100% frame coverage, Bionz X image processor, a 3" LCD screen, and full HD 1080/60p video recording capabilities, and WiFi and NFC connectivity. The flagship A7R model features a 36.3MP Exmor sensor without a low-pass filter and is designated for professional photographers and advanced enthusiasts. The less expensive A7 is intended for amateur photographers stepping up from compact cameras. It is equipped with a faster 24.3MP Exmor sensor with a low-pass filter and on-chip Phase Detection system. The A7R and A7 will be available in December and are priced at $2299 and $1699 for body-only kits. For other compatible parts, please see Sony A7/A7R accessories. The α7R model features a 36.4 effective megapixel 35mm Exmor® CMOS sensor – the highest resolution sensor in the history of Sony’s α line – with no optical low pass filter for added resolving power and increased image detail. The α7 model boasts an impressive 24.3 effective megapixel 35mm Exmor® CMOS sensor and an innovative fast Hybrid AF system. The new cameras both have on-board Wi-Fi and NFC capabilities for instant image sharing and transfer to compatible smartphones and tablets. The α7R and α7 models can access Sony’s platform of PlayMemories™ Camera Apps, allowing users to add new effects, filters, utilities and more. This platform includes new ‘Multiple Exposure’ app, which automatically combines sequential exposures into one creative shot, and ‘Smart Remote Control’4, which allows for direct control of exposure and shutter speed from a connected smartphone and is particularly useful for self-portraits or group shots5. Find out more at www.playmemoriescameraapps.com . Designed for professional photographers and highly advanced enthusiasts, the new α7R model is the world’s smallest and lightest full-frame interchangeable lens camera2. Offering an exciting entry into the world of full-frame photography, the α7 camera features an advanced 24.3 effective megapixel full-frame Exmor CMOS sensor paired with the powerful new BIONZ X processor. There are a total of 5 new full-frame E-mount lenses designed to take full advantage of the powerful imaging capabilities of the α7R and α7 cameras, including mid-range zoom lenses from Sony and Carl Zeiss, two bright Zeiss Sonnar T*™ prime lenses and a premium-quality G Lens™ telephoto zoom. Sony’s growing E-mount interchangeable lens lineup now consists of 21 different lenses including the new full-frame models. In addition to the new lenses, there are also two new-generation mount adaptors that give photographers the ability to utilize full-frame Sony A-mount optics on the α7 and α7R cameras. The LA-EA3 adapter simply adds compatibility for existing A-mount lenses the new cameras, while the LA-EA4 model adds the ultra-fast focusing and shooting capabilities of Sony’s innovative Translucent Mirror Technology. There is also a new vertical grip (VG-C1EM) that offers greater comfort during vertical shooting and can accommodate two separate NP-FW50 batteries for extended battery life and shooting time. A new BC-TRW compact external battery charger that quickly charges batteries and is great for travel, and FA-CS1M off camera shoe allows the use of external flashes (HVL-43M, 20M) in off-camera wired applications. Additionally, the new LCS-ELCA premium soft leather carry case protects the α7 and α7R cameras from scuffs and marks while being carried. The Sony α7R and α7 full-frame interchangeable lens cameras will be available for purchase this December. The α7R camera will be offered as a body-only for about $2300. The Sony α7 compact system camera will be offered with a 28-70mm F3.5 – F5.6 full-frame lens (model SEL2870) for about $2000. It will also be offered as a body-only for about $1700. Please visit www.blog.sony.com for a full video preview of the new Sony α7R and α7 full-frame cameras and follow #SonyAlpha on twitter for the latest α camera news. 5 α7 series will become compatible with “Camera Remote API beta”(http://camera.developer.sony.com) , API (Application Program Interface) for remote operation of Sony camera with Wi-Fi-equipped smartphones and electronic tablets, after installation of the most recent Smart Remote Control that is distributed from countries providing PlayMemories Camera Apps.